Discussion in 'Science Fiction & Fantasy' started by Kail, Nov 21, 2015. I find B5’s acting good enough for the show but a tad hammy. 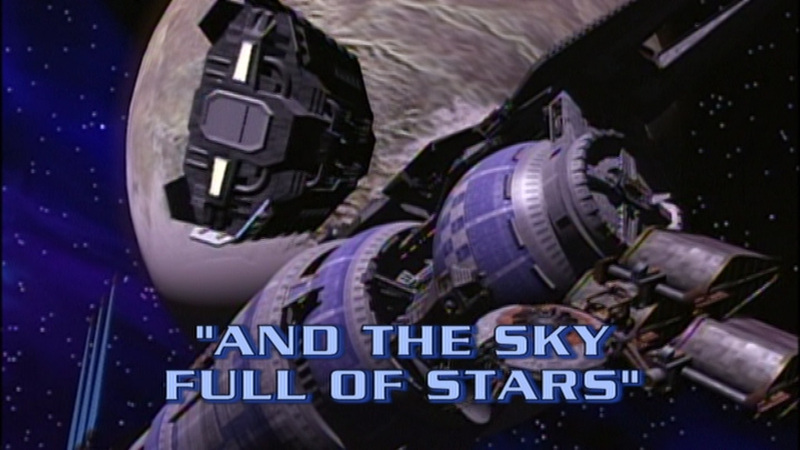 Just as I was hoping both for an episode to truly kickstart the "real" story of the show and for something that sheds some light on the Earth/Minbari war, I get this nugget. Of course, it doesn't "reveal" much; that's why we're still in season 1 I guess. But I'm definitely on board this ride for the long haul. Delenn was involved in Sinclair's capture? That's one heck of a bomb which really makes the dynamics of the station a lot more interesting. I can't wait for all this simmering plot to eventually boil over, when that "hole" in Sinclair's mind is filled (if it ever is). I found this one largely engaging even if it provided little in the way of answers; perhaps because I wasn't necessarily expecting it to. I liked the simple structure of the story without a B-plot, bolstered hugely by the performance of the main interrogator (missed his name, if they gave it). The first episode that I would legitimately describe as "very good". Now that the groundwork has been laid out and I'm comfortable with the characters and station dynamics, I'm looking forward to this story hitting new heights in future. - Is it wrong that I quite enjoyed the image of Garibaldi being "killed" and was kinda hoping it would happen again and again to really drive home the interrogator's point? - The FX seemed noticeably better in this episode. The space battle sequences were satisfactory. Not just a Coldplay song. Two things you should be aware of. The late Michael O'Hara was struggling with severe mental health issues during season one, which is why he was replaced in S2. John Straczinsky (AKA JMS) actually wrote Sinclair's backstory and plot arc to parallel O'Hara's condition - an interesting take on method acting. The second thing that will hopefully blow your mind - digital animation was still in its infancy. The complex calculations for animating trajectory used by planes and starships and everything else simply did not exist yet. The animators "flew" each Starfury by hand, laying out flight paths and so on practically frame by frame. BlueStuff: tread carefully in this thread. B5 fans have a reeeeeeeeeally bad habit of dropping spoilers when peeps are documenting first time watches like you are. It's inevitable and will happen. I guess we'll just have to wait for the hour of longing then. Deledrius and Gov Kodos like this. That's a little bit of a stretch. A starfury or cruiser flying in a straight line was still just defining two positions at two times and the software would move it appropriately. I think what you're thinking of is more when the 'furies engaged in more complicated maneuvers, in episodes like "Midnight on the Firing Line," "Soul Hunter," and [[IMMINENT DOGFIGHT-HEAVY SEASON ONE EPISODE]], where the animators had to synchronize the thruster flares with the maneuvers by hand, something that'd typically be done automatically with scripting tools a decade later (such as with the tiny thrusters on the Vipers in nuBSG) (God, I hope those were automatic, I've never seen anyone actually say, but there were a lot of them, and I'm sure Lightwave's scripting and expressions tools were able to handle such a task by 2003). I don't think it's much of a spoiler to say Sinclair is riddled with PTSD. From the beginning, LigtWave used paths to plot motion, so the flight paths weren't necessarily just keyframe animation. Though I'm sure there was a lot of that too. to add other motions. I liked the simple structure of the story without a B-plot, bolstered hugely by the performance of the main interrogator (missed his name, if they gave it). The actor is Christopher Neame, previously in Doctor Who and Blake's 7, later in Voyager (among much more). But Patrick McGoohan was initially approached. Interesting. I remember the actor from Licence to Kill (1989); he's a British agent charged with bringing "loose cannon" James Bond back to headquarters. The FX seemed noticeably better in this episode. The space battle sequences were satisfactory. Not sure which aspect ratio you're watching this in but the cropping of CGI 4:3 content in the conversion to 16:9 severely degraded the picture quality. But, yes, the FX do improve steadily over time. 25 years ago I was seriously impressed with what they could create. I'd say by season three, you couldn't really find anything to complain about with the CGI. It was every bit as good as the rest of the industry which it helped create. I never noticed a problem with the cg ships until after watching season 5 I broke out my VHS of The Gathering, then I noticed it wasn't as good as what I was used to. I had no problem with it the first time around. You're not imagining things. Between season 3 and season 4 there was a whole rigamarole with their VFX provider, Foundation Imaging, which ended up in B5 producer Doug Netter founding his own knock-off CG Studio, Netter Digital Entertainment, which took over for the last two seasons. They inherited a lot of work from Foundation, but NDE's staff largely didn't have as much experience, and generally had a different sensibility and style. And, while I never found out who, somewhere between season 4 and 5, at least one person on the team just fell in love with snap-zooms, so you'd keep getting these weird shots that didn't match with the sensibility of the show at all. The interviews on B5 Scolls (plenty of behind the scenes info on B5's makeup and VFX, but beware of spoilers, new people) have some information/gossip on the Foundation Imaging/Netter Digital transition. I don't recall where it all is, but this is the first page I found that starts to go into it a little. I believe there are more takes in other interviews. IIRC there was eventually a settlement with Foundation that barred both sides from discussing the case, but Netter Digital had to start from scratch without access to Foundation's files. According to Ron Thornton, Netter was basically sabotaging Foundation Imaging and B5 and wouldn’t budget an extra $75 per episode for a $5k NTSC Widescreen monitor. It's been years since i read that, but a lot of the work was done by hand that even a few years later would become much more automated. I don't think it's much of a spoiler either. It's been there since the first few episodes.